A Westland, Michigan, father was stunned when a cop went above and beyond to help him get a car seat for his 3-year-old daughter. LaVonte Dell said he was driving with his daughter in the car when he was suddenly pulled over. "When he hit the lights, I did what probably everybody would do. Heart dropped. Went to my stomach," he said. Dell thought maybe he was pulled over because of his tinted windows, which turned out to be correct. As the officer walked over to the car, he noticed that Dell's daughter, Lauren, wasn't in a car seat. "I asked him why is she back there without a car seat. It's not safe. 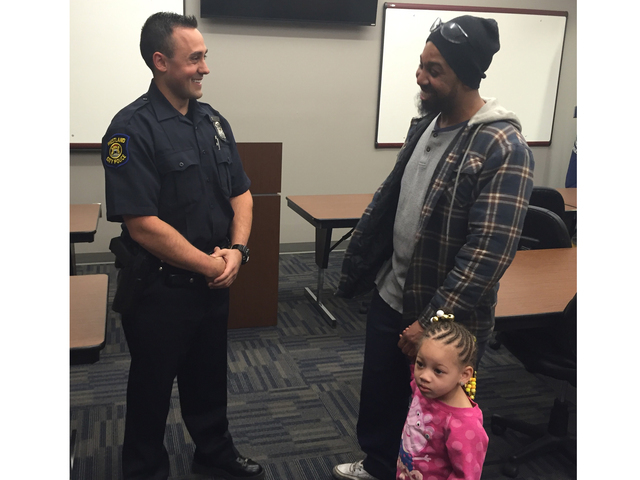 He teared up a little bit and told me he was going through some tough times," Officer Joshua Scaglione told WXYZ. Scaglione then asked Dell to step out of the vehicle, and the young father said he feared that something bad was about to happen. Instead, Scaglione began asking Dell about what was happening in his life. "I related to the fact that I've been in that situation before. I realized this was the perfect opportunity to help him," Scaglione said. Instead of issuing a ticket, the officer drove Dell to a nearby Walmart, where he bought him a car seat. While the two walked around the store, Dell said they hit it off like they were longtime friends. "You would have thought we were best friends. No awkward silence. I learned about him. He learned about me," Dell said. "He seems like [a] blue-collar hard-working guy who was doing the best he could for his family," Scaglione added. Dell later realized that he never asked for the officer's name, prompting him to share the experience on Facebook. It quickly went viral. "I feel like he should get the recognition. Everyone should know what he did," Dell said. He added that his appreciation for police grew after the incident and he encouraged others not to "judge a book by its cover." Many readers applauded the officer for going above and beyond the call of duty to help the struggling father. "Thank you to the officer for making sure that little girl was safe and treating her father as a human being, sometimes you just don't have the extra money you need for something you need in life," one Mad World News reader commented on the site's Facebook page. "Yea. That's awesome. Lots of very good. Police. Lots of very good people. All colors. Need more of this. Love is so much better than hate," another wrote. "Thank You, the safety of the child was the most important thing on the Officers mind. God Bless. We all go thru hard times, but there are truly people that care !! Amen," another added.